Appointed as the new president for New Britain New Ireland Mission of the Seventh-day Adventist Church, taking over leadership from Pr Peter Yambe who has gone for further studies, Pr Danny Philip, is on his first official on travel and visit in West New Britain Province. 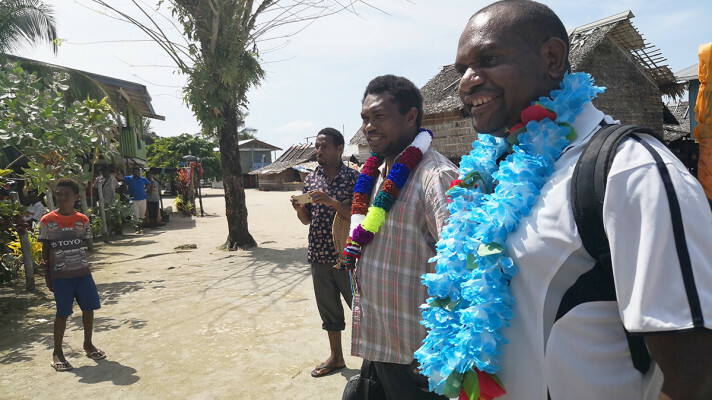 Kove District, having its District Coordinating Committee (DCC) meeting on Sunday 3rd March at Moputu Village gave opportunity for President Pr Danny Philip to travel to Moputu to meet with the Kove District church leaders and elders. Moputu village is located on the coastal areas of Kove District - Travelling there took a 1 1/2 hour drive from Kimbe to Kandoka village and then 45 mins boat ride to Moputu. We (Carole & I) have travelled to Kimbe yesterday morning. Upon our arrival our AS, Pr Gah, took us straight to Kove District and attended their DCC Meeting at Mopute Village (where Pr Julius Divu comes from). They had finished their meeting but just waited for us. Upon arrival Elder Jimmy Baki did some presentation on Provincial Government’s financial commitments or grants especially to Isu clinic and school and the Hope Radio. Pr Gah promoted mission’s programs such as Matupit 90 celebration, Children Ministry Convention, Discovery Bible Reading, etc. Carole mention Hope FM and its progress. I thanked our local church ministers and pastors, coordinators, leaders, DD, and the entire church at large for the support to the gospel ministry. I also thanked Elder Baki and the Provincial Government for their support to the Adventist Church in WNBP. I also mentioned the challenges of the church reporting system and encouraging them to submit accurate information, the Bible Discovery Reading at their homes, and other important information that churches needed to know and to action them. The team had a great lovely meal with the church membership before travelling back to Kimbe. Pr Philip will spend two weeks in West New Britain Province to visit as many of the districts as possible and meet with pastors and church leaders. This year, 2018 has been quite an eventful one for the Seventh-day Adventist church in Pomio district. As the church geared up to host one of its first ever events to date in history, there was literally no time to sleep considering the immense workload ahead with so little time to spare. These were the challenges towards the birth of Mission Pomio. Since this was the first of its kind that the local Mission ever decided to host a program on Pomio soil, the magnitude of pressure, enthusiasm and anticipation was intensifying as well as enormous, seen on the people on the ground as they worked towards this huge event. With the theme, “It’s almost time” the dele-gation for Mission Pomio was led by the di-rector of Women and Children Ministries in N.B.N.I Mission , Ms. Dianne Pelap and her delegation of women from North and South Gazelle districts who travelled by ship to Pomio to attend the program. The program was hosted at Drina, RH Oil Palm Camp and lasted for a week from Octo-ber, 22nd - 29th, 2018. This one week camp brought together both the entire church at Pomio district as well as the general public and even as far as the Wide Bay district to witness and participate in the activities. It featured extensive training courses on tailoring, Cooking, Drapery, Medicinal Herbs, Health and various community visita-tions, facilitated by the women who com-prised the delegation. Other special members of the delegation included the Mission president, Pr. Peter Yambe, the technical team from Hope Radio and the Messengers, a singing ministry. While most of the activities ran throughout the day, an evangelistic meeting concluded the evenings part of the daily schedule, presented by Pr. Peter Yambe. At the peak of Mission Pomio was the combination of three grand events that ended the week-long event. These were the Mass Baptism and Wedding and ground breaking of the district’s Resource Centre. 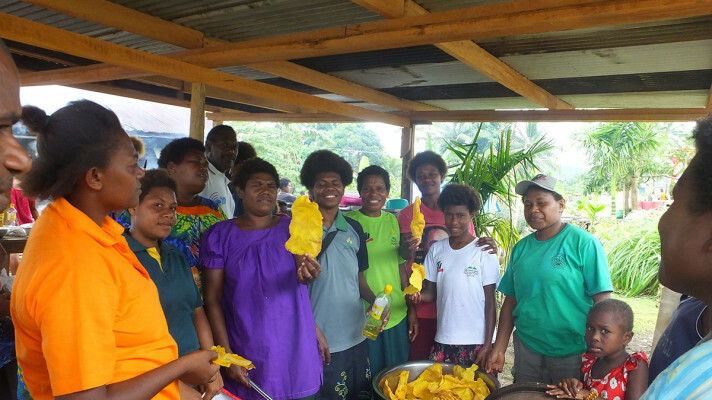 For the people of Pomio, although Mission Pomio has ended since October, the story will never leave their hearts or lips as they continue to spread the news of im-pact and goodness this event has brought to this humble remote district.